Every time I see this particular picture, my heart starts beating hard. For a second – EVERY TIME – I think maybe it will end differently, maybe someone will prevent it, maybe. But we all know it doesn’t happen that way. That second plane smashes into the side of Tower Two and bursts into flame. More than 3,000 people will be dead before the sun sets. I remember where I was. I remember watching the news all night and wondering if it was over. And who had done this. Why would they do it? I remember nightmares – dreams that didn’t really make sense but still held the same sense of foreboding I felt when I heard news coverage on the terrorists. I know I’ve never slept alone at night since then without difficulty. I’ve never casually gotten on a plane without thinking of who was on my plane and if we would make it to our destination safely. My sense of security – my naiveté – my invincibility were all gone. They would never be the same. But you know, I haven’t thought of those things in a long time. I don’t remember what it was like to worry about whether someone would be blowing up something in Dallas next. I don’t remember the grief I had for our country, for those families. I’m glad that today will be honored. I’m glad the people that we lost will be remembered again. I’m not glad we have to remember, but I’m glad we will. 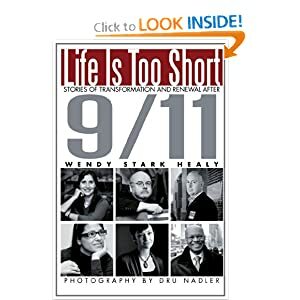 I was sent a copy of a book called Life Is Too Short: Stories of Transformation and Renewal after 9/11 – it’s an incredible collection of stories of those who were able to take the tragedy they lived through and turn it into a story of change and triumph. It’s easy to let the disaster that occurred on September 11, 2001 leave us feeling discouraged, beaten up and sad. If that’s where you’re at today, I would suggest you pick up a book like this and focus on the good things that came after that horrible day.